Complimentary Gift from Sigma! HURRY | Sahrish Adeel - Malaysia based Pakistani Beauty & Lifestyle Blogger! Sigma is offering a complimentary gift on a purchase of $75 or more. This a beautiful sample kit that has samples of Sigma's Dare, Bare & Flare! 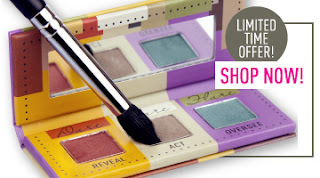 It has one eye shadow sample from each palette. Check out those palettes HERE. Hurry up and go get shopping because this is a limited time offer. Click on the picture to explore their website.